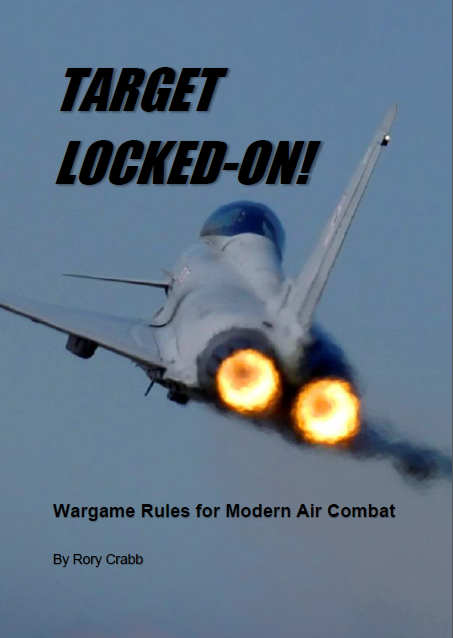 A couple of years ago, I tried to buy a physical copy of Airwar C21 to play with a couple of folk at my local wargaming club, but got the run-around from the distributor/seller. I have a preference for physical copies and don't like paying for PDFs when I will just have to pay more to print them out. Needless to say, I gave up on Airwar C21, and didn't feel comfortable getting my friends to pay for it. Well, recently browsing I found a new game which looks along a similar style, but a bit more streamlined, called Target Locked-On by Rory Crabb. It's available as a PDF from Wargames Vault/Drivethru RPG for under US$8, so I made an exception to my PDF rule, picked it up and have started reading it. That aside, it looks like a great set of rules. Easier to read and follow than Airwar, and easier to make sense of. So far, it looks to be the superior product. I also really like that the Aircraft Control Sheet lists the stats in a nicely laid out and easy to read format. The acronyms of Airwar made it hard to understand what the stats were if you hadn't looked at them for 6 months. But with Target Locked-On, it's all perfectly readable. As a bonus, you can download additional aircraft lists, as well as templates and counters, all for free on Rory's website. I'm really looking forward to get into this and have a play, and it'll motivate me to finish painting some of my aircraft, which have been sitting neglected for far too long. I'm also hoping this gets a physical print-run, or becomes available as a print-on-demand book. The former would be my preference as a saddle-stitched booklet, perhaps with all the other add-on PDFs merged together as a supplement book. A Kickstarter perhaps? I'd support that. What do you think? Have you played it or does it pique your interest? I've only tried playing Check your six! for airgames. Any possible comparison thoughts you can offer up? If you check out Rory's website and grab the aircraft control sheet, it will give you a good idea of the stats involved and what's needed to play. It looks pretty good, seems fairly straightforward to explain. Doesn't seem to be much pre-work involved and I think a half hour of picking some planes and rolling/choosing your pilot skill levels would be all that's involved. There are a bunch of scenarios as well so you can have different flavours in your combats. My plan over the next couple of weeks is to clear the gaming table of the mountain of books being temporarily stored there, and giving this a bash solo or with a friend. Apparently it plays well solo because of the initiative system. I'll get a more detailed report up when I do.